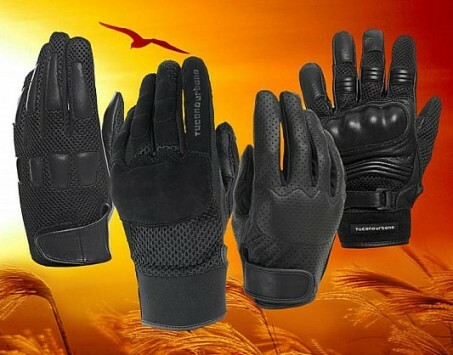 Tucano Urbano has designed a collection of vented motorcycle gloves: Aero, Shorty, Bat and Mrk. Different styles and designs, but with a clear objective: to your summer trips in the city are comfortable and safe. If you want to protect your hands when riding on bike this summer, but do not want to spend heat, the Italian brand of equipment for urban mobility, Tucano Urbano, makes it easy. Four types of gloves: MRK, Bat, Shorty and Aero, for you choose which one is more your style and fits your needs. The mid-cut Mrk gloves allow full ventilation of the hand as they have mesh on the back. With a modern design, in Tucano Urbano not forget the security: MRK have rigid protections of ABS in the knuckles and suede fabric on the palm. It can be found in sizes from XS to XXL and priced at €35.50 (VAT included). The Bat is characterized by a sportier “look”. It allows a more aggressive driving since they are equipped with rigid ABS reinforcements in the knuckles and D30 applications on the Palm. Compatible with the use of mobile devices, ventilation is not a problem thanks to the 3D mesh incorporated into the back. The Bat is available in sizes from XS to XL to a price of €59 (VAT included). The Shorty gloves from Tucano Urbano are made of perforated leather and have a sleek and sophisticated style. For the protection of the hands have a padding of foam in the back. Sold in sizes from XS to XL and have a cost of €47.50 (VAT included). If you want a comfortable and relaxed driving on hot summer days, the Aero gloves of the Milanese firm are a good choice. Its 3D mesh allows the passage of air and stretch fabric between the toes get the most flexibility for the hand of the rider. It is available in sizes from XS to XXL, are sold at a price of €33.50 (VAT included).